BILLERICA, Mass.--(BUSINESS WIRE)--Iowa Department of Transportation (DOT) employees are the first in the nation to use the MorphoTrust mobile driver license (mDL) software as part of a new pilot announced today by MorphoTrust USA (Safran). MorphoTrust, the identity solutions provider to more than 80% of U.S. motor vehicle agencies (MVAs), including Iowa, has delivered a test version of the secure mDL software to an appointed Iowa DOT user group who will assess and validate the solution for use in situations where physical licenses are typically presented. The pilot will also test record updates to the Iowa DOT’s customer record system with the changes rendered on the phone in real-time. Information such as change of address, over/under 21-years-old status, organ donor status and change in driving status, endorsements, or restrictions, can be updated to the mDL immediately. The MorphoTrust mDL software carries the same level of trust as its physical counterpart, the driver license/ID card. The mDL software includes both visible and covert security features that are linked and layered in the digital image seen on screen. These features not only ensure a high level of security, they also enable the mDL to be quickly and reliably authenticated when presented for identification purposes and protect against fraudulent reproduction. In addition to PIN and fingerprint-based security features already built into phones used in the pilot, the mDL app can be secured using MorphoTrust facial recognition unlock technologies which requires the user to take a selfie and use a custom PIN. 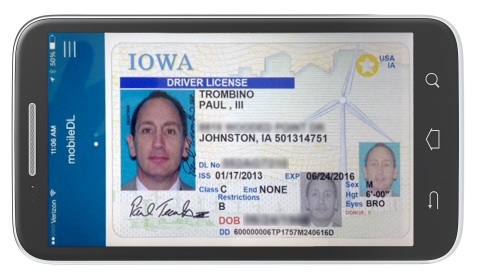 Iowa Department of Transportation (DOT) employees are the first in the nation to use the MorphoTrust mobile driver license (mDL) software.